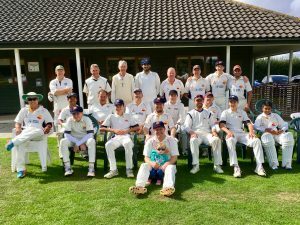 Great Melton’s annual President’s match provided a fitting finale to the season with two teams of club members and a few guests enjoying a good humoured but well contested 36-over-per-side game. President Nick Evans-Lombe’s team were invited to bat first having lost the toss but posted an excellent 249-6 with Nick himself scoring 31, Lee Whiddett 41, Sam Mann 31, Steve Phoenix 36 (retired) and Josh Wright 34 not out. There were 2 wickets for Becky Greenslade and one each for the two Clives, Gristwood and Melhuish, plus Aslam Mohammed but 45 extras told it’s own story. In reply the ‘Club XI’ were bowled out for 215 with Aslam stranded on 54 not out having run out of partners. Kai-Wilkinson-Loines hit 41, captain Ben Mann 33 and Matt Clarke 22 but the President’s XI gave away fewer extras and generally bowled more consistently than their opponents. Joey Greenslade and Lohit Kannan took 2 wickets apiece with one each for Ben Johnson (plus a run out), Lee Whiddett, Glyn Webster, Anush Ganesh and skipper Steve Phoenix who also held 3 catches. The day was followed by a ‘Games Night’ at the club that included darts, video games and pizza – and, of course, a few beers!